2015 February — Open Source Strategies, Inc.
Uniqlo is not just thinking, Gee how do we get more Instagram followers to sell the same old T-shirts? If little Instagram could build a billion-dollar business by turning the mobile phone into the ultimate device of self-expression, why couldn’t Uniqlo…or you? Was Microsoft the Greatest Open Source Business of All Times? This is a historic document that shows the exact moment when Microsoft began taking over the world. 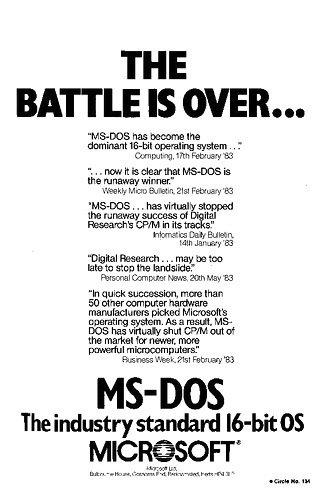 Its main products at the time were BASIC and DOS, but DOS was the indispensable layer of the Personal Computer (PC) industry. It sat between the hardware and software of the IBM PC and its myriad of compatible clones. What’s most amazing about Microsoft and DOS, though, is that everything above and below them were open sourced. If you wanted to build an IBM-compatible PC (like Compaq and Dell), the architecture was openly available, as long as you built it for DOS. If you wanted to write software for IBM PC’s and compatibles (like Ashton-Tate and Lotus), Microsoft and DOS provided you with open standards too. As a result, millions of IBM-compatible PC’s were built and millions of programs were written for them — far more than ever was the case for Apple’s Macintosh. They turned IBM and Microsoft into the standards of the industry and made companies like Dell, Lotus, and Intel wildly successful. But not as successful as Microsoft. Because through it all, Microsoft didn’t open source its products. There were no DOS (or Windows) alternatives that a Compaq could package with its PC’s to run Lotus 1-2-3. There was never an open “PC operating system standard” that would allow software and hardware vendors to write once (or build once) and run any operating system. Competing operating systems like CP/M, Xenix, OS/2, and BeOS all failed because there wasn’t enough software written for them to attract hardware manufacturers, and not enough hardware manufacturers making computers to attract software developers. As a result, Microsoft ended up controlling the entire PC industry, eventually even muscling giant IBM out. For open source developers: Open sourcing of software is just small potatoes. There is so much information that, if made openly available, could create whole industries and make people’s lives better. So isn’t it time we stopped thinking just about the code and started thinking about how to create openly available knowledge that could benefit the world — and build great businesses?